Looking for some facts about the gorgeous lilac breasted roller? You're in the right place! In this post, you'll learn almost everything there is to know about this little beauty. 1. What does a lilac-breasted roller look like? 2. How many colors does the lilac breasted roller have? 3. How did the lilac breasted roller get its name? 4. How big is a lilac breasted roller? 5. How much does a lilac-breasted roller weigh? 6. What is the lilac-breasted rollers wingspan? 7. Are lilac-breasted rollers friendly? 8. How long do lilac-breasted rollers live? 10. Is the lilac-breasted roller endangered? 11. What do lilac-breasted rollers eat? 12. What is the lilac-breasted roller’s Latin name? 13. What other names does the lilac-breasted roller have? 14. Are lilac-breasted rollers monogamous? 15. How many eggs does the lilac-breasted roller lay? What do they look like? 15. What is the lilac-breasted roller’s call? 16. Are lilac-breasted rollers loud? 17. Where does the lilac-breasted roller live? 18. What is the habitat of the lilac-breasted roller? 19. Where does the lilac-breasted roller nest? 20. Where can I see the lilac-breasted roller? 21. What is the national bird of Kenya? 22. What is the national bird of Botswana? 23. Is there folklore about the lilac-breasted roller? The lilac-breasted roller is a member of the roller family of birds, which is also known as Coraciidae. It is a strong and swift flier. 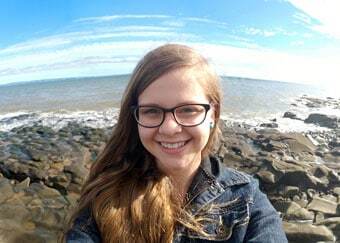 Read on to learn all about it! The lilac-breasted roller has a robust body and a proportionately large, green head with a heavy black beak. It has a white chin and a white or yellow band above the eyes and beak. Its breast is a dark lilac that grows lighter towards the throat. The abdomen and underside of the wings are turquoise, and the wings’ underside is also trimmed with dark blue. The upper part of the wings is reddish brown. Their forked tail, which is also turquoise, ends in black streamers. Males and females have the same coloring. Juvenile birds don’t have the black streamers, and their throats and breasts are reddish-brown. As they reach maturity, their throats and breasts will turn lilac. Like other members of the roller family, the lilac-breasted roller has syndactyl feet with the second and third toes fused together. While its upper legs have turquoise feathers, its lower legs and feet are bare, scaly, and yellowish. The lilac-breasted roller could have just as easily been called the “rainbow roller.” They have around 8 colors; green, white, black, yellow, turquoise, dark blue, reddish brown, and of course lilac. That is one colorful bird! Rollers, in general, owe their common name to their mating display, which consists of a lot of dives and swoops accompanied by loud and harsh cries. During a mating flight, a lilac-breasted roller will fly upwards for about ten meters (33 feet) and then swoop down with wings closed. In another aerial stunt, the lilac-breasted roller will roll from side to side while flying very fast. If the aerial courtship is successful, the two birds will mate in the air. A lilac-breasted roller can be 36 to 38 cm (14.2 to 15 in) long, and that length includes the tail which can be 8 to 9 cm (3.1 to 3.5 in) long. The lilac-breasted roller has an average weight of 104 grams (3.7 ounces). The males are slightly larger than the females. The lilac-breasted roller can have a wingspan between 50 and 58 cm (19.7 and 22.8 in). “Friendly” may be a stretch, but they do not fear humans. You can get quite close to a lilac-breasted roller without it flying off—which is great when you’re trying to take a picture. On the other hand, lilac-breasted rollers are fiercely territorial, and they will object if you get too close to their nest, even if they don’t currently have eggs or chicks. They also guard their favorite hunting grounds and will chase off intruders. Lilac-breasted rollers have an average life expectancy of around ten years in the wild, and captive birds can live somewhat longer. They are ready to breed when they are around two years old. Various birds of prey are the main predators of the lilac-breasted roller. Known predators include Wahlberg’s eagle (Hieraaetus wahlbergi), the red-necked falcon (Falco chicquera), the peregrine (Falco peregrinus), and the Bateleur (Terathopius ecaudatus). Researchers haven’t yet performed an estimate of the bird’s wild population, but they believe that it is stable. The lilac-breasted roller is not currently listed as endangered. Lilac-breasted rollers eat mainly insects like beetles and grasshoppers. They will also take snails, scorpions, and sometimes small lizards, rodents, and other birds. Lilac-breasted rollers like to perch on high treetops or telephone poles to watch for their prey. When they see something, they will swoop down and batter their target with their wings. After beating their prey into submission, they will swallow it whole. One of the cooler lilac breasted roller facts is that these birds are clever and bold enough to take advantage of brush fires. As various small animals and insects flee the flames, the lilac-breasted roller will swoop down on them. In fact, lilac-breasted rollers will hunt near the edge of a fire. It's hard to believe that such a pretty little bird could have something in common with the marabou stork! The Latin or scientific name of the lilac-breasted roller is Coracias caudatus. The Swedish scientist Carl Linnaeus gave this cool bird its scientific name in 1766. There are two subspecies, C.c caudatus and C.c. lorti. 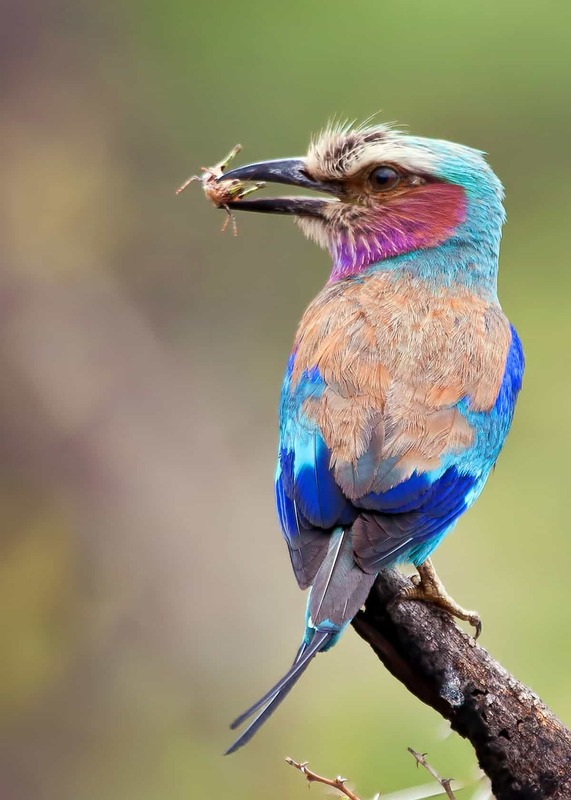 The latter is sometimes called the “blue-breasted roller” or the “lilac-throated roller.” The two subspecies live in different parts of Africa, and their ranges do not overlap. The lilac-breasted roller is also known as Mosilkatze’s roller, the fork-tailed roller, and the lilac-throated roller. Confusingly, the last name is also sometimes used for a subspecies of the purple roller (Coracias naevius). People in Zimbabwe sometimes call the bird Mzilikiazi’s roller after the 19th century Matabele king who liked to use the bird’s feathers in his headdresses. Lilac-breasted rollers are believed to be monogamous and mate for life. In the wild, adults are usually found by themselves or in pairs. They may stay in small family groups during the winter. The lilac-breasted roller typically lays between two and four eggs that are plain white. Both parents take turns caring for the eggs, which hatch after 22 to 24 days. The hatchlings are altricial, which means they can’t move around on their own and need parental care. It takes about 19 days for their feathers to grow in fully. The chicks will remain with their parents for another month. Lilac-breasted rollers lay only one set of eggs per year. The lilac-breasted roller’s call has been described as a squawking “zaak” or “raak.” They will vocalize during their mating flights and will sometimes call while perched on a branch. Lilac-breasted rollers produce loud and harsh calls. Some people have compared the noise to that of a steam train. The lilac-breasted roller lives mainly in sub-Saharan Africa and can also be found in the southern part of the Arabian Peninsula. It is quite common in Kenya, Zimbabwe, Botswana, northeastern South Africa, and much of Namibia, excluding the Namib Desert. The lilac-breasted roller can live anywhere between sea level and up to a little over 2000 meters (6562 feet) above sea level. The lilac-breasted roller is generally not migratory. The lilac-breasted roller prefers to live in savannas and open woodlands where it has access to trees for perching and nesting. Conversely, it avoids treeless areas. While it does not fear humans, the lilac-breasted roller avoids environments that have been affected by humans, like cities and farms. The lilac-breasted roller likes to nest in trees. It will look for a tree with a natural hole and lay its eggs inside the hole. The lilac-breasted roller may also lay their eggs in an abandoned kingfisher or woodpecker’s nest hole. It might also nest in termite mounds. Both parents will aggressively defend the nest from raptors and other predators. You can see the lilac-breasted roller in a zoo. You can also find them in some of Africa’s national parks. The lilac-breasted roller is particularly common in Kenya. While lilac-breasted rollers usually don’t live near humans, people living in sparsely populated areas might be able to tempt a bird into visiting by having a tall tree or pole that can serve as a perch. Lilac-breasted rollers will use nesting boxes if they can’t find anything else. The national bird of Kenya is the rooster and lilac breasted roller. The lilac breasted roller can be found almost anywhere in the country. 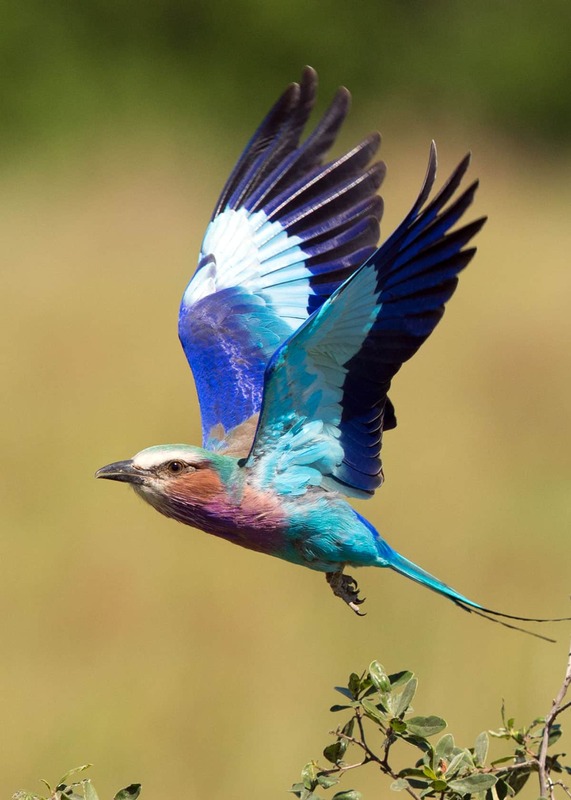 Furthermore, Kenya is home to over 40 ethnic groups, and the lilac-breasted roller’s many colors could represent that diversity. Even though Botswana doesn't have an official national bird, it is generally thought to be the lilac breasted roller. The lilac-breasted roller is common, unafraid of humans, and boasts spectacular plumage – a near-perfect bird as far as birders are concerned. The lilac-breasted roller has appeared in the folklore of some African cultures. 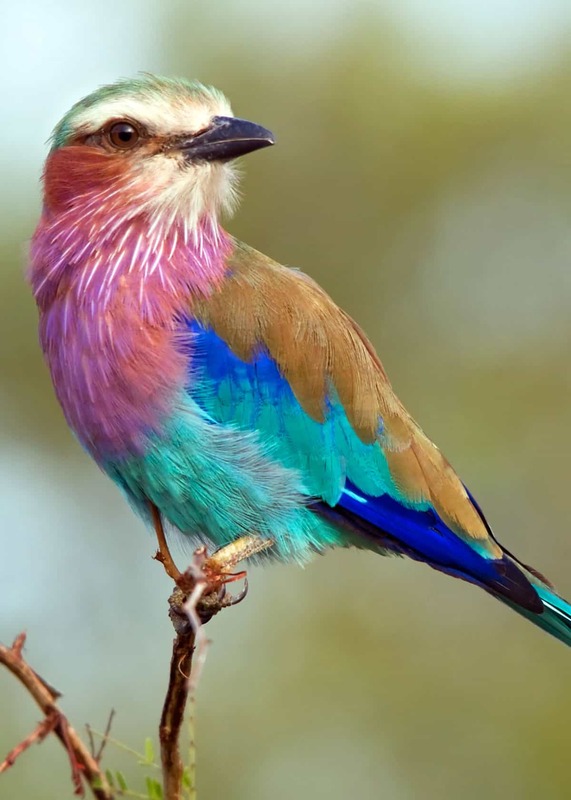 Some African tribes historically considered the lilac-breasted roller to be a symbol of peace, and their kings would sacrifice it to celebrate the end of a war. The Zulus would use chains or ropes made from the feathers of a lilac-breasted roller to test a young couple’s compatibility. A couple who wanted to marry had to be tied together with a feathery chain. Keeping that chain together tested the couple’s ability to work together, and if it fell apart, they could not marry. The Venda, who live along the borders of Zimbabwe and South Africa, made wedding rings from the bird’s feathers. The Afrikaners, who descend from Dutch settlers of South Africa, have historically decorated wedding dresses with the lilac-breasted roller’s feathers. The belief that the lilac-breasted roller mates for life may have inspired the various marriage traditions. We hope you've enjoyed learning about this beautiful bird! Which fact was your favorite? Did we miss one? Let us know in the comments!